Now, 24 visitors are online. 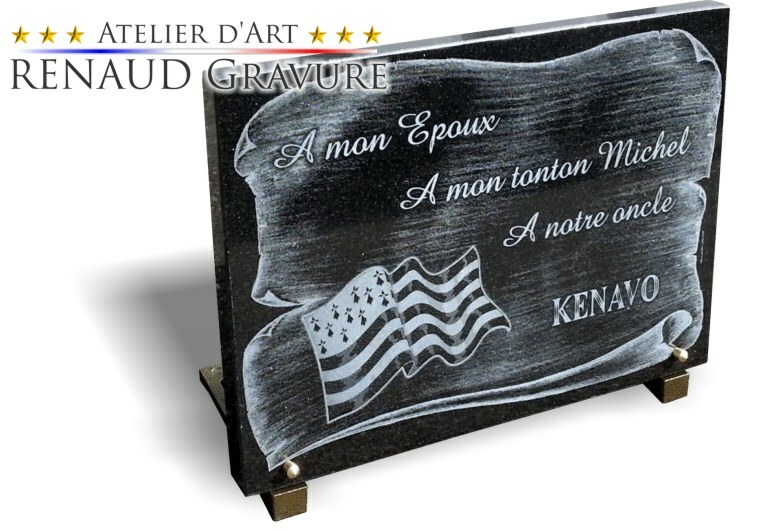 Our engraving is exceptional, it is dug in the mass, extremely resistant, perfectly inalterable and of an unequalled precision. 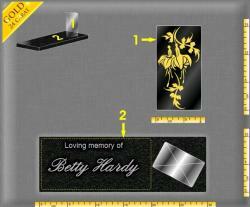 We do not make laser, digital printing or stickers! 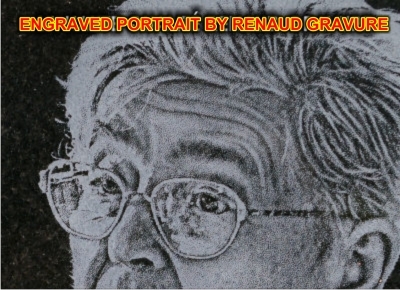 Unique : Each portrait is worked artistically by the artist Jocelyn RENAUD. This internationally renowned engraving artist is officially listed on the art market. 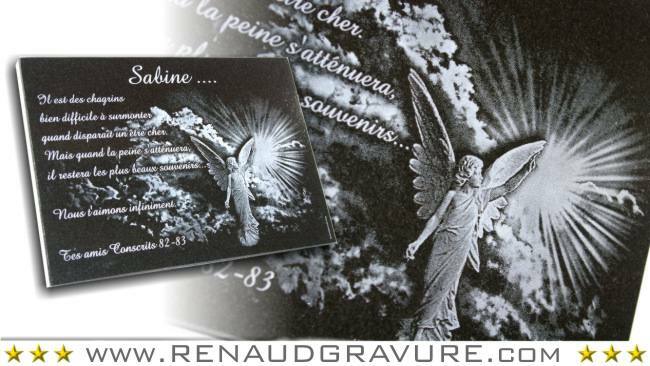 For each engraved photo order, a photo-realistic and artistic study is presented to the client for approval before engraving. 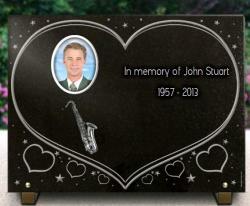 Our granite is deep black and perfectly homogeneous. This one comes from the best quarries in India. We process directly locally in order to reserve the most beautiful slices of this magnificent granite. 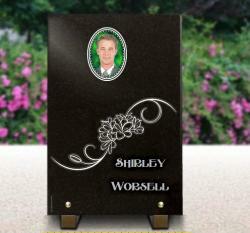 Create a granite grave plaque with real time pricing! The customisables models below are only a small part of the creative possibilities. Rating : 9.9 / 10 - 641 reviews collected by Google. 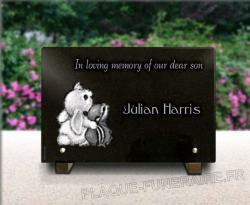 Grave granite plaque to customise online. 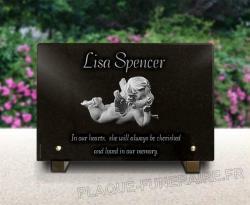 Engraved angel on granite plaque. The price includes this full customization. 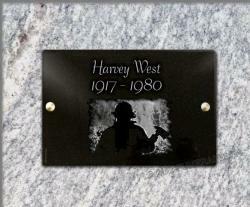 Trust a professional engraver to make a unique grave plaque. judge the unique and higher quality of our work . Stable strength of the engraving in the mass. 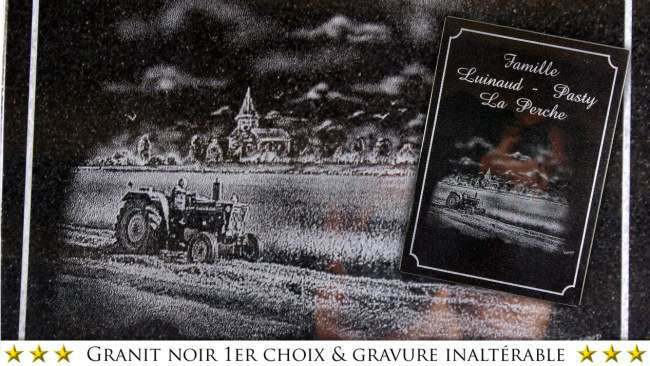 Authentic engraving guaranteed more than 50 years. 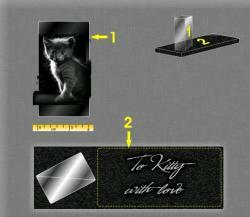 Here the real appearance of the photoengraving by the machine. to be able to watch the inelegant screen. 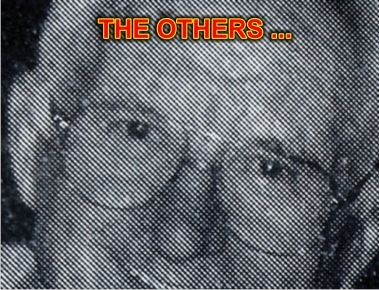 which don't represent at all the ugliness of the screen. thus it is covered by a microscopic coat of paint. This paint can soften in hardly few months ! Then without paint, the microscopic tracing becomes invisible. 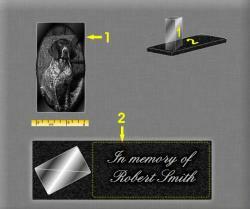 It is the major detail of the laser because it is not an hollowed engraving. 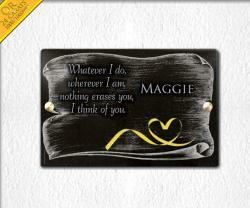 Guarantee without laser tracing, serigraphy nor selfadhesive. 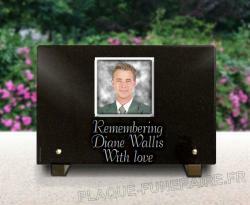 Customised granite memorial plaque of 20mm thickness, 30 cm x 20cm. Engraving of a parchment and of a Breton flag (Gwenn ha Du ). 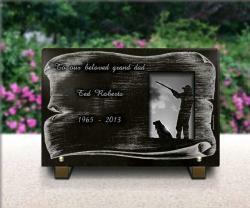 We engrave on request, make up your model online with our configurator. 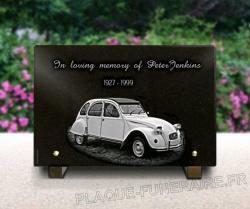 For your special requests, do not hesitate to contact us, we will grave whatever you want. they are stable, this is not at all laser tracing or printing. 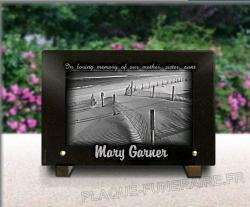 Photo of a memorial plaque in black granite. 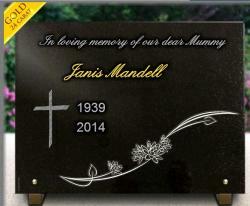 Memorial plaque delivered drilled with its 2 screws and hide screws in brass. 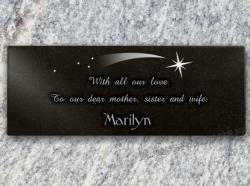 As usual, our engraving is stable because we don't make laser tracing nor serigraphy. 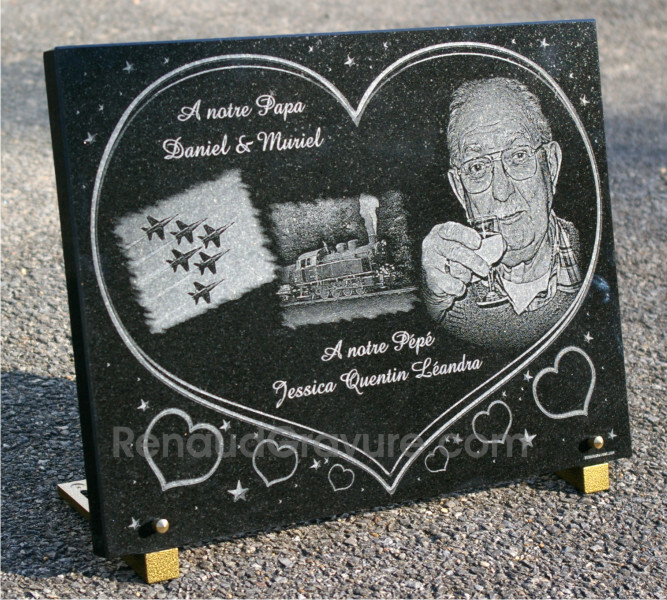 Below : Memorial plaque heart 25x35cm with hearts and stars. 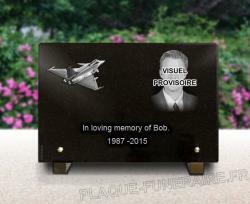 also engraving of the two photos provided by the client ( train and fighter plane). before manufacture for agreement because a manual artistic work is done for each photo.